Day 814-826 Can't Ignore This Issue, One More Pound, The Tattoo Story, and More! Can't Ignore This Issue, One More Pound, The Tattoo Story, and More! This is way too long to go between blog updates. Oh my...wow. A record of sorts, that I'm certainly not happy about. I sincerely appreciate the support and understanding many of my friends have expressed during this incredibly busy time. Not only has it been busy, but I've been dealing with a medical issue that I've kept very quiet about. The effects of sleep apnea have had a profound effect on me lately. My needs have obviously changed in regard to the settings of my old "sleep machine," and now--a restful nights sleep is hit and miss at best. I can't waste any more time and do any more damage to my internal organs before receiving proper treatment. I really thought that my sleep apnea was 100% caused by my obesity. And it's strange, because after losing the first 100 or so pounds, I was completely free to sleep---machine free, and feel completely rested every morning. But something changed. As I celebrated my freedom from this disorder and continued losing more weight, the symptoms came back. It was sometime after crossing the 200 pounds lost point, that I noticed the return of the old and familiar effects from this exhausting killer. I'm happy to report: I'm scheduled for a sleep study on the night of December 30th. I cannot continue wishing it away or convincing myself that I can lay in a certain "symptom-free" position. The doctor said something I've been worrying about almost constantly since---He said that the return of my symptoms could have something to do with damage to my heart caused by my years of morbid obesity and the lack of oxygen as a result of sleep apnea. He almost ordered a stress test--but after listening to my heart, considering my exercise ability, and whatever else he took into consideration---He, we---decided to wait on that test. Instead--we're doing a sleep study. If you suffer from sleep apnea--trust me, it's nothing to mess around with...and in the spirit of 100% self-honesty--I've messed around with it a bunch lately. It's about time I do something positive to correctly treat the problem. This is the worst possible time for me to feel like an exhausted wreck everyday. With my radio schedule and the manuscript weighing heavy on my plate--I must be alert and productive. I haven't been lately, at all. And my slow progress is proof. I made my way to Stillwater to weigh-in the other day. I didn't make a big deal about it--It was just a check up for me. 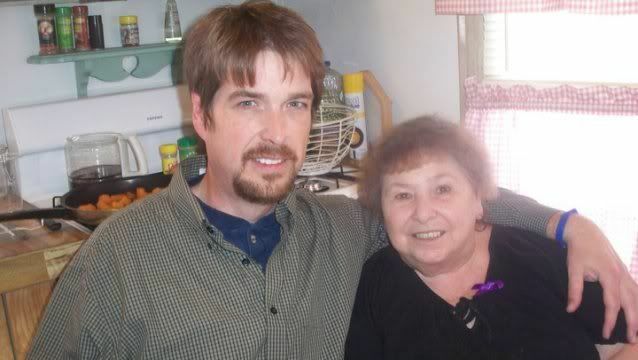 I've lost another pound, despite my beautiful grandmother's request that I "not lose another pound!" Sorry grandma---229 is what I weigh today. I still have some weight/excess fat to lose and I'll naturally and gradually make my way to whatever that number will be. I also have some weight to gain---as in, with muscle--in the new weight training area of the YMCA. So really--the number isn't going to matter as much as how I feel and how my clothes fit my smaller body. If I'm fortunate enough to have excess skin removal surgery next year, that too will effect the number. But again---I can't get focused on a number, ever. It's not about that now. I've allowed myself "extra" calories over the course of the last month---gradually increasing to about 1800 per day. Some days I do, some I don't. It just depends. I still find myself spending way too many calories on loose snacks in the kitchen at the studio. The other day, I consumed about 350 calories worth of pretzels and nuts. That's a little much. The solution? : Preparedness. I simply need to make a point of stocking the kitchen with the kind of snacks I enjoy so I'll feel good about the calorie investment I'm making. You want to hear a very cool story? In March, Amber and I traveled to this tattoo shop in Southern Kansas to get our very first tattoos. 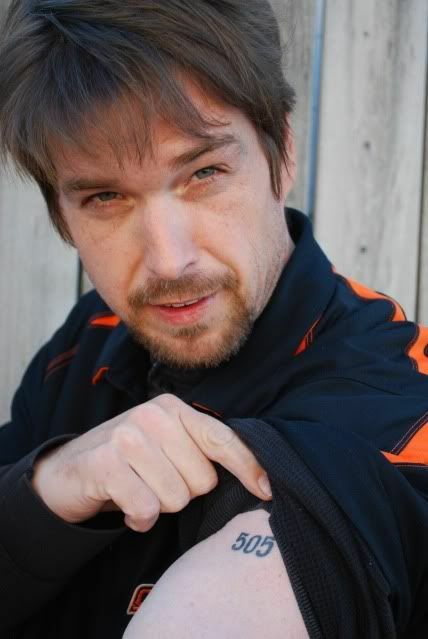 My "505" tattoo is obviously very important to me--and it has been a wonderful experience to have and show people---especially people that never knew me at 505. It's certainly a conversation piece. Well--now the story gets even better. The incredibly talented tattoo artist that evening was assigned probably one of the easiest tattoos he's ever completed. "505," nothing fancy--simple block numbers, that's all I wanted--and honestly, all I needed. He was a heavy man himself--I really liked him, and he was of course, interested in the story behind the number. So I told him all about my weight loss and this blog. We had a wonderful conversation about weight loss and our experiences with losing and gaining weight over the years. I'm sure that if we had talked longer, we would have found much more in common...a bunch more, no doubt. A recent message from my tattoo artist friend: "Great news to report!!! In the last 6 months, thanks to diet and exercise, I've lost over 140lbs!!!! Feels amazing!!!!! Thanks for the inspiration my friend!!!" "Yes, a tattoo is definitely in order once I hit my target weight!!! I started at 460lbs, my goal is to get down to 200lbs. Just too feel this great again totally outweighs any desire to eat "bad food"!!! I feel so alive!!!" I love that story. Thank you, my friend for allowing me to share. I was fasting overnight in preparation for my blood work today. By the time I arrived at the doctors office it was nearly noon. Lucky for me they got what they needed on the first stick. The other day they stuck me several times to no avail. While they were at it they decided to give me an EKG. My heart rate was 59. They said between 60 and 80 is perfect. They also said it wasn't a big deal that mine was 59, in fact the EKG looked great. The blood work was going to take a couple of hours to get back from their lab. That gave me a little time to think. “What if my numbers are bad?” I thought. I don't know how they could be, since they were pretty good to begin with. I seem to never pass up an opportunity to worry about something, even if there's no immediate reason for concern. When I made the call for the results I was very happy at what I heard. My cholesterol was in the 180's before I started losing weight, and that was good. Now my cholesterol has dropped nearly 40 points to a super nice level of 147. 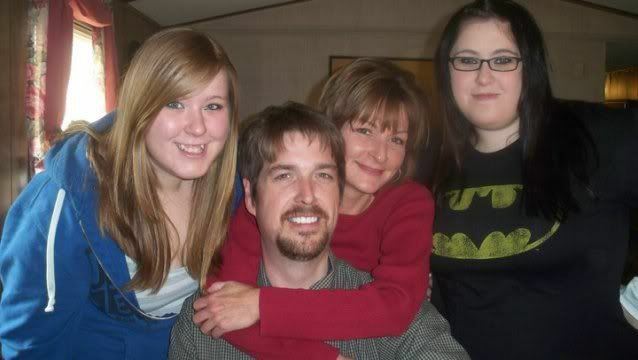 It's nothing more than a genetics blessing. Like I've said before, except for the last 103 days, I've done everything in my power to give me horrible cholesterol. I'm just real fortunate to have a 147. My triglycerides were 102, anything below 150 is good. My blood sugar was 99, well below the 119 limit of normal. My LDL was 96, under 130 is great. And my Vldl was 20, which is in range. I guess “in range” is good. They said everything was in range, just perfect. How crazy is that? I told you, I've been hiding an athlete under all this fat! I had to lay down and pull my shirt up for the EKG. It gave me a perfect opportunity to ask a question I'd been real concerned about. A month or so ago I was laying down on my bed feeling my ribs. I'd never done that before. I came across a hard bump at the base of my rib cage where the two sides meet. It was very hard, a bone no doubt, but it was sticking up a little. I immediately wondered if this was normal. So there with my shirt up laying on the table at the doctors office, I had my chance to find out. “Is this normal?” “Uh, yes, that's your sternum.” OK, wow, silly me, of course. I was hiding a sternum in there all this time, I just never could feel it, or bothered to notice. I wonder what else I'll notice as the weight continues to melt? I might end up having a tail bone, that would be cool. 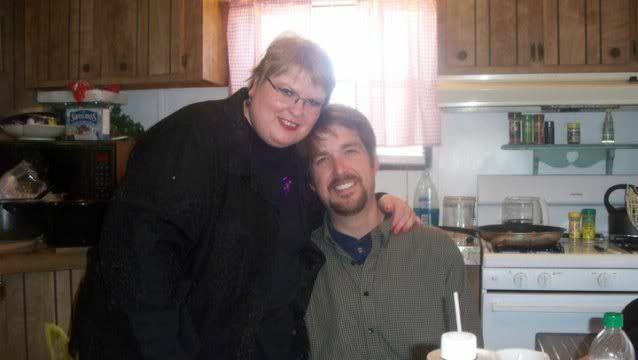 By the way, the doctor I mentioned on day 2 of this blog, you know the one that brought me to tears while describing how easily I could die at over 500 pounds? She was there today. When I saw her I proclaimed, “there's the doctor that scared the heck out of me not too long ago.” She smiled and said “It worked didn't it?” Yes, it did, and it's continuing to work everyday. She was just brutally honest, and I'm thankful for that honesty and thorough description of what my insides were going through at over 500 pounds. I'll never forget her. She really made a difference in me. Since that day---I've discovered a tail bone, a bunch of ribs, and hip bones too! I'm thrilled!!! The Ponca City News just released a wonderful write up all about me hitting my goal. The story was such an awesome blessing. A big thank you to Beverly Bryant and the PCN!! If you live outside of my local area--you can still read the article by clicking the special link below. The story is on two different pages of the below Ponca City news PDF link. The front page of section C---and then scroll down to page 3C for the rest of the story---including an extensive question and answer interview segment. Here's the link: http://www.poncacity.com/news/docs/mw/mw.pdf By the way--This PDF link will only be available for a week---so if it's after the 29th, it's probably not active. 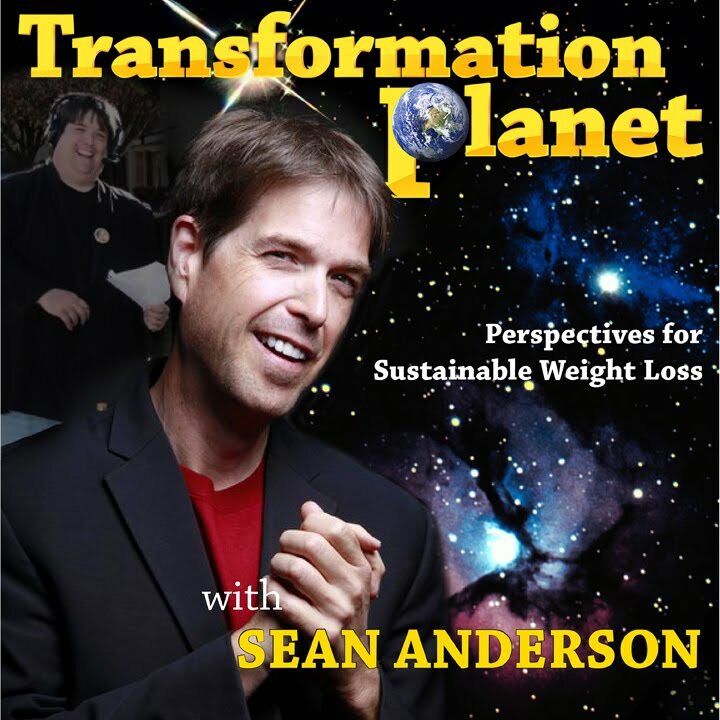 I recently received a message from a gentleman who just started his own weight loss blog. It turns out, we have much in common. Please check out his blog if you have the time! The address: www.505point8.com That's right---he started at 505 too!!! 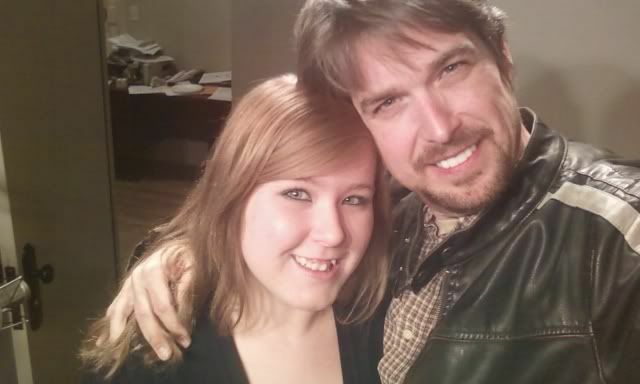 Recent picture with my youngest daughter Courtney. She's doing so well!!! Love you sweety!!! 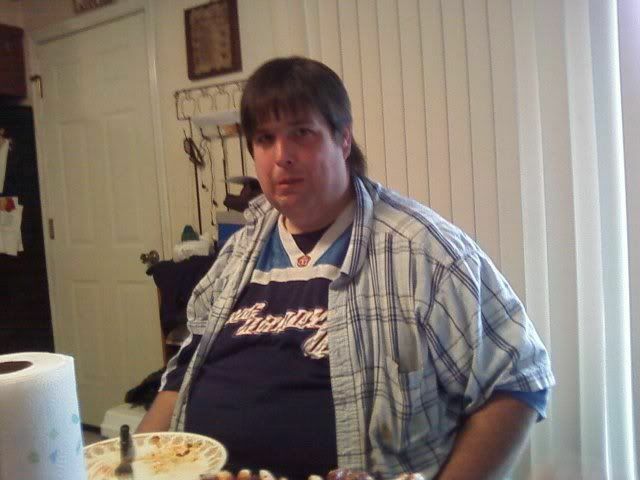 This is a big before picture--Over 500 pounds---at Christmas 2007!! Day 805-813 Size 54 Jeans Seemed So Small, A New Relationship With Food, and "Wow" Reactions! Size 54 Jeans Seemed So Small, A New Relationship With Food, and "Wow" Reactions! A friend of mine sent me a big box of jeans recently. Really nice jeans too! Even a pair of size 32 Lucky Jeans. I'm wondering if he meant to send those. It might take some time, workouts, and maybe excess skin removal surgery to wear them--but I think they just became my "one of these days" jeans. It was a generous gift, indeed. And perhaps I can pass along the favor to someone else someday. I will, absolutely! "Today has been a really long day. It started at 5am and it's not over yet! Kelli and I went to Oklahoma City, Kelli for a birth certificate, I was driving Kelli, and since I was down that way picked up a pair of Levis at the Big and Tall store. The other day I predicted that I would fit into a mens 54. After picking out a few 54's and a couple 56's, I went in to the dressing room to get some proof positive results! I tried on the Levis 560 54 inch waist first. And from the moment they buttoned and zipped without trouble, I knew they were the ones. Eighty-Five days ago I was a size 60 or 62, then I nailed the guess the other day! And these will only cover my hide for a very short time, I know, but it felt so good to get into them comfortably. I immediately ripped off all the tags, put on my shoes, and made my way to the checkout with the jeans I wore in the store bundled in my hand. I was buying these jeans. And I wasn't even going to take them off for the ride home. They were mine. They felt good, they were Levis! It's been a while since I could fit into Levis comfortably. On the way out of the store I gave a little wink to the 36's on the top shelf, as if to say... “I'll be back for you someday soon!” And I will! I wonder what that will feel like? I can't wait to find out! Before that triumphant jean buying trip, I'll buy bigger sizes along the way, sure. Size 42 will be a milestone size. That's the size I was wearing in 9th grade. I'm really not that far away!! It felt so good to wear those jeans out of the store, I didn't even notice how tired I was." Now, after losing 275 pounds, and having a pair of size 36 Levis that fit nicely--It's very cool to read that excerpt and realize: I buy jeans from the top shelf now, you know...where they keep the smaller sizes! I love it! I've had several emails asking me about my plan for maintenance. Like everything else along this road, I'm gradually getting there. I'm not quite ready for maintenance just yet. BUT---I am slowly increasing my calories. My budget is flexible now, anywhere between 1500 and 1800 is fine with me. I must say though, there are days when I still have trouble hitting 1500. Let me explain, because for some, that must sound really annoying to read. I have become very practiced at getting the most bang for my calorie "buck," and that natural tendency to trim calories where I can is kind of hard to shake. Instead of an egg white omelet, it's OK to throw in a whole egg, maybe two sometimes. I can add a little cheese to that baked potato. I can "afford" to spend a little more occasionally, on things I would normally trim or delete. The bottom line is this: I'm just eating like a normal person, not like a food addict. I no longer depend on food to make me happy. I make me happy, not ice cream or gravy. Food is good. I love food, always will. But food and I have a new and wonderful relationship that isn't dysfunctional. And it's something I never really thought possible, but now I know it is, because I'm living it everyday. An example of this new understanding between food and me was very clear just last weekend at a wonderful place called: (Cue scary music) The Cheesecake Factory!!! I did my research going in, and really--I didn't like what I discovered. Their menu is loaded at almost every turn. Even things that look and sound innocent enough, must be prepared with butter, grease, and heavy cream, because the calorie counts are anything but innocent. I was really shocked. I was surprised too, about the cheesecake. A big regular slice was just over 700 calories, slightly under 360 for half--and that's what I did, half. It was a bit more calories than I normally "invest" in dessert, but that's just something that happens sometimes. I need to make that a t-shirt: Cheesecake--It happens, sometimes...was it good? Yes --It was by far the best cheesecake I've ever consumed!! Before the cheesecake, we enjoyed a meal. The strategy was simple: Karen and I would share a meal. We picked something good, that didn't seem too loaded. We would be guesstimating at best, because the pecan crusted catfish was a "special of the day," and not a part of the calorie counts I found online. And oh, by the way--the calorie counts I found online were from a person in the Northwestern United States, a place where calorie counts are required by law, who took digital pictures of the entire menu--with calorie counts. 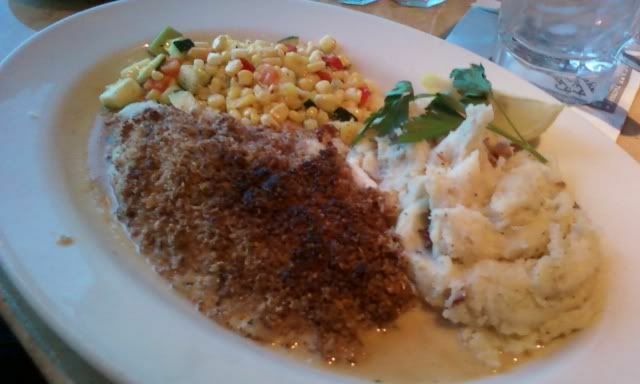 The eleven ounce catfish fillet was "crusted," but seared, then baked. I had half--along with half a serving of the potatoes (which qualified as a regular serving) and half the corn succotash. I'm confident my plate was under 600 calories...add the calories of the cheesecake, and this was easily a thousand calorie expenditure. But it wasn't three or four thousand calories--and I think Old Sean could have made it that way. I had managed my calories a little short earlier in the day, just for this trip. That's not always the best thing to do metabolism wise, but it's something normal people do. "I knew we were going out later, so I had a light lunch." See--completely normal rationale. I experienced a couple of "wow" reactions recently, that really left me feeling wonderful. I just love running into people I haven't been around in over two years. The only thing recognizable about me, is my voice. That's it! And often times, that's what is said: "If I hadn't heard you speak, I wouldn't have known it was you!" I really enjoyed this one: "Sean, is that you??? How much weight have you lost, dear Lord---look at you!" Yeah--that was very cool. I NEVER, never, never get tired of those...ever. 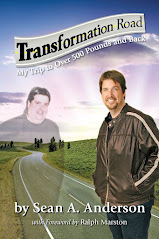 I'm continuing to work on the manuscript for my first book, "Finding Transformation Road," a weight loss memoir that chronicles the road to and from over five hundred pounds. I sometimes wish I could share some of it with you here, but I can't. I'm so excited, because it's really been a positive experience. I can't wait for you to read this---If you have enjoyed reading this blog from Day 1, then you'll appreciate this upcoming book. I've allowed my work schedule combined with my sometimes poor sleeping schedule, to effect my writing schedule this week, but I'm always mindful of what pays the bills at this point in my life, and that's my broadcasting career. I still struggle with getting enough quality sleep, and that's not good at all. I must also remember--sleep deprivation can have horrible effects on ones health and well being---including metabolism!! 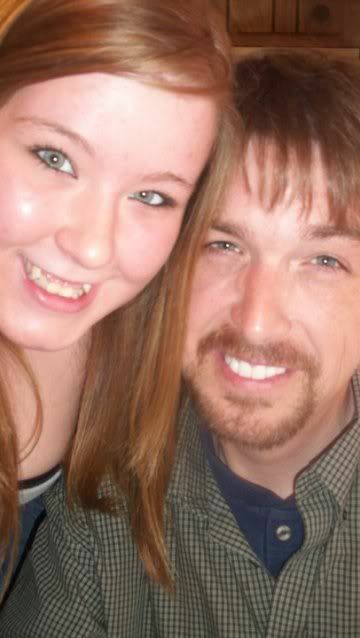 To the kind and caring friend that reminded me that "there's no room for vanity in heaven." 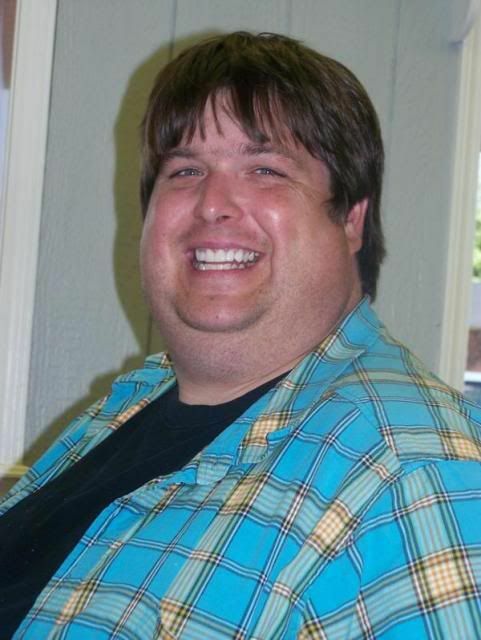 I say this: I've spent my entire life hating the way I looked, feeling like the ugliest person in every room, feeling like a freak because of my morbid obesity. Even now, I'm still highly insecure about how I look in so many ways. So, I appreciate the loving guidance and intent--but I will not apologize for kind of liking the new me. Call it vanity if you wish, whatever. I've been very blessed along this road, and I give thanks everyday---in between taking new pictures, of course. I'm kidding. Seriously---I never forget from where I've come. That's exactly why I have my "505" tattoo. It reminds me everyday...and that's good. Photo courtesy of Cathy Cole! 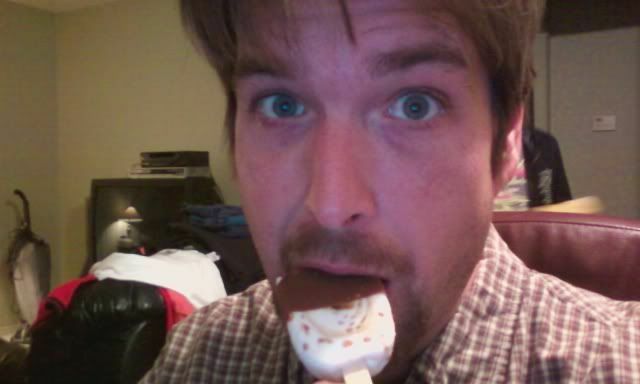 I found these amazing ice cream bars from Breyers--for only 130 calories each!!! Love 'em!!! 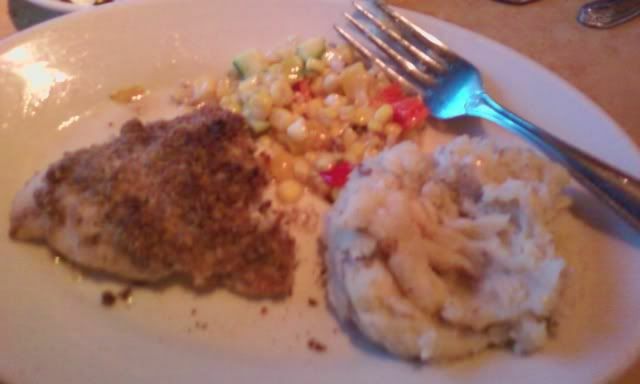 The pecan crusted catfish dinner from The Cheesecake Factory--as served. My half was plenty of food--very nice! 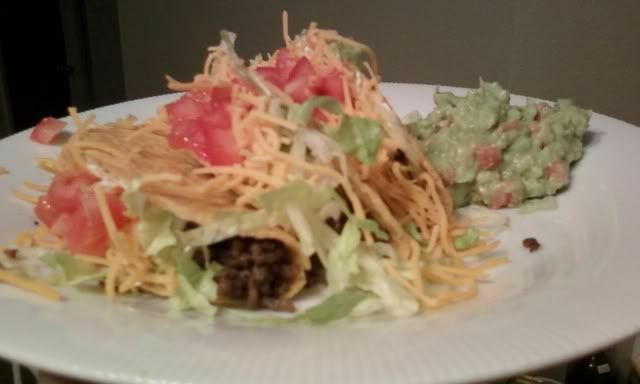 Homemade beef tacos and homemade guacamole---almost qualifies as a salad...almost. Preparing Thanksgiving dinner and enjoying the family and friends of the holiday was so special to me, especially since hitting goal. It's a nice feeling to be in control, to enjoy food instead of abuse food, to be normal and healthy...to be happy and content. To be me. There wasn't any desire to stuff myself sick, in fact, my plan of allowing 2500 calories turned out to be a good one, but kind of a challenge. I know that must sound crazy, especially on Thanksgiving, but I'm so prolific at getting the most bang for my calorie buck--sometimes, I should relax a little and eat a little more maybe, but why? If I'm eating decent amounts and I'm satisfied, then I see little reason to push it to 2500, just because it's Thanksgiving. I wasn't deprived in the least! Having this kind of relationship with food is nothing short of a dream come true for me. I owe it all to my "nothing is off limits" philosophy and my "Calorie Bank and Trust." Had I restricted certain foods or only consumed certain foods in my efforts--then I wouldn't have recovered from my food addict ways, because I would have been avoiding the issue--focusing on a means to lose weight, and not the behaviors with all food that always kept me morbidly obese. I will always consider myself a food addict, but I'm aware and mindful of from where I came--and now, food and me...well, we're friends. Life and food, is good...absolutely! I haven't really touched my calorie budget just yet. I'll get there. I'll cruise under 230 a little and really start to decide where I want to take this body of mine. The new YMCA facility opens Monday and I'm thrilled about getting in there and using everything! Oh my---it's beautiful! I received a nice tour from the senior program director, and I must say, I'm impressed beyond description. The "cycling studio" has an amazing sound system and stadium style levels for optimal viewing. The pools are incredible too---and the fitness area with treadmills and everything else you could ever want---it's unbelievable! I'll be broadcasting from the new facility Saturday morning from 8 to 10am--can't wait!! 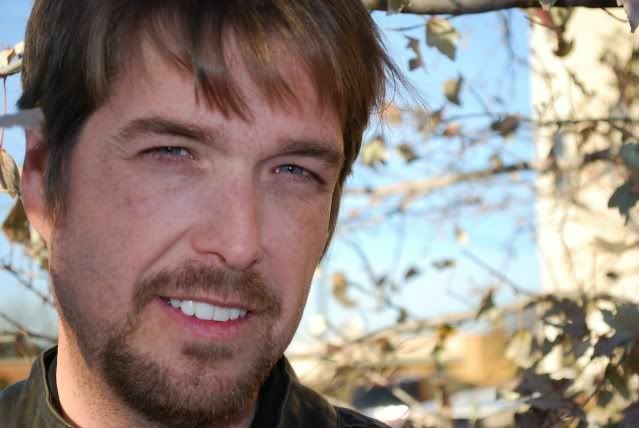 "Sean, was reading a couple of your blogs from the beginning. Its funny, It hit home with me in so many ways. I eat at least 1 meal a week from Wendy's, Grilled chicken sand(no honey mustard) and large chili, very satisfying for 610 calories. I don't want to jinx it, but I am pretty confident when I weigh in on Friday(e...nd of week 19 133 days) that I will eclipse the -100 lb mark, wow what a mile stone in sight. PS wearing even smaller chefs coats yet again, and i officially don't own any clothes that fit me." I LOVE that! Jamie--can you believe it??? I'm so happy for you!!! 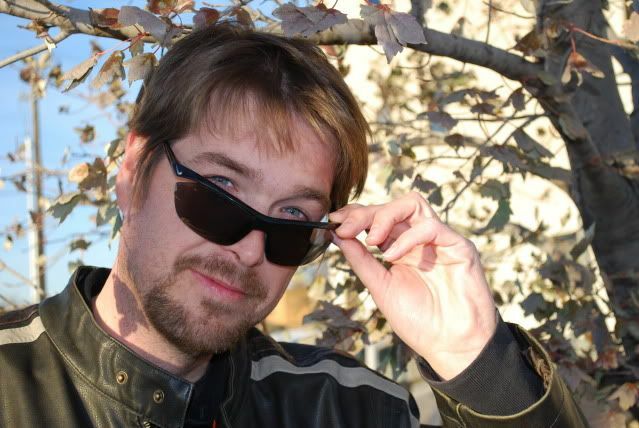 "Well Sean....today I finally caught up to the present of your blog. I've been reading it since July after reading your story on AOL about losing weight without eating one salad. As I mentioned recently I've lost 31 lbs while getting my daily inspiration from you. Now that I've finished your blog and understand your not writing daily I will go back to the beginning and read one a day as well as your new posts as you post them as I want to continue to be inspired by you daily. I know you get told this often by probably thousands of people now but I just have to thank you from the bottom of my heart for the life change you have helped me through. I only wish I had come to this understanding 25 years ago! I'll definitely be looking for your book. Thank you again!" "Hi Sean, have a great day. I have to brag a little. 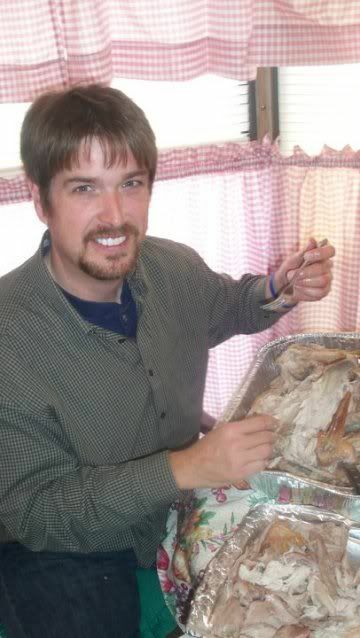 My husband and I went to Missouri for the Thanksgiving holidays for five days and he lost 2 pounds and I lost 1. We ate what we wanted but kept our calorie count in check. You have helped us so much with your attitude of this is not a diet, we can eat anything we want, we have to stay in our calorie range. You do not feel like you are missing out on anything. My husband has lost 15 pounds and I have lost 20 so far." Jamie, Leah, Pat--I can't thank you enough. When I receive messages like these, it just fills me up with joy, it's a constant blessing everyday. It truly makes me overwhelmed with happiness!! This has been a crazy day. Some days are so easy and then for no apparent reason I have a day like today. I've battled my will all day long. Then we took a nap at 3:30 with plans to get into the YMCA by 4:30 so I could get assistance with the machines and we ended up over-sleeping. After dinner I started getting sick to my stomach and a headache. So there ya go, a really challenging day, out of the blue without any obvious reason. I've had every last single calorie I can have today already and it's been a real struggle to not go over. I'm really going to have a long talk with myself before I go to sleep tonight. This is day 78, we've come too far to start having self-destructive urges. I wish I understood why? Usually there's some kind of stress trigger or emotion that I can pinpoint, but not today. I've been through these trying days before (see Day 60) and I've survived by focusing on getting to the next day intact. I just need to survive a couple more hours and I'll be in bed ready to put this day behind me. I am pretty upset about not working out, and now that I'm feeling sick and Courtney's not feeling well, we'll probably miss our workout tonight. That's not the worst thing in the world. We've missed some in the past, but it's certainly not an everyday thing. Considering the circumstances, I'm not going to feel too bad about not getting out there tonight. As long as I can get to bed without going over my calories, I'll count this day as a victory. I've learned that no matter how determined and strong willed I am on this mission, I mustn't try to be so darn perfect all the time. I'm way far from being perfect. I'm doing the best I can do and on 97% of the days that means I stay within my 1500 calories and I exercise. It's days like these, the days that test me, these are the days I'll remember most when I reach my goal. The near misses, near breakdowns, the unexplained absence of will power in critical situations, and overcoming them all, these are the victories that mean the most. I can and will do this all the way. Sometimes the person that needs to read my past blog post the most is me. Before I ever experienced a tough day I wrote about how easy this was. In the right mindset it can really be a breeze, but like I've said before, this is a learning process. I've never claimed to know everything, all I have is my vast experience in being severely overweight my entire adult life and trying many times to lose weight. This is like weight loss school and every now and then there's a pop quiz that totally boggles me. I've studied my past behavior patterns, I've re-played failed attempts in my head, I've studied every label and calorie count I come across, and I'm still learning something new all the time. All I have to do is keep doing what I've been doing, stay strong and focused, and every thing will be alright, alright! I'll tell you one thing, it's days like today when this blog really keeps me from a self-destructive binge. The accountability that this blog demands is very important to my mission. I've said it before, it's like therapy for me. I can't imagine not writing every night. A lot of times these blogs flow easy, some times it's harder, as I search for words to describe what I'm feeling and experiencing. 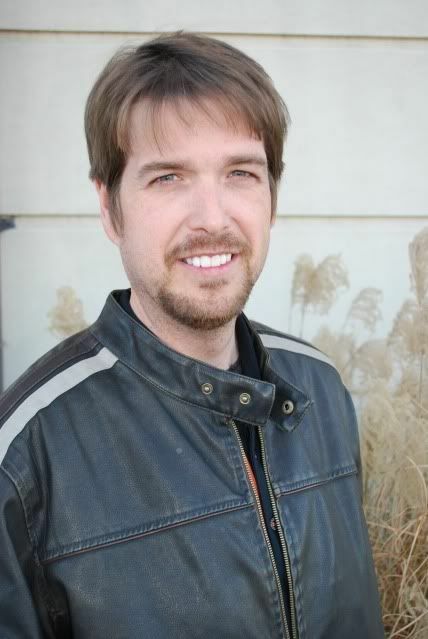 The support that I receive everyday from my wife and kids, readers like you, and people that I run into that notice the difference in my appearance is incredible. That support is the most important resource I have along the way. The blog is like a back up re-enforcement. I sincerely appreciate you reading everyday. Thank you very much. Tomorrow is a new day. Tomorrow I will learn how to do the machines properly at the Y, tomorrow I will erase any doubts that this day presented, tomorrow is day 79, and I'm ready. Friday morning found me and my friend Karen at JC Penney for their big doorbuster sale. 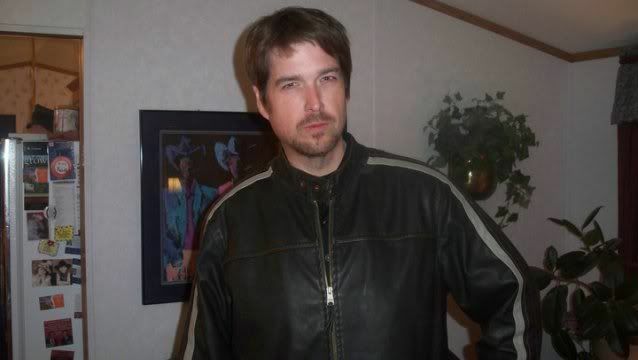 I needed a coat, a jacket--a leather jacket was the plan. 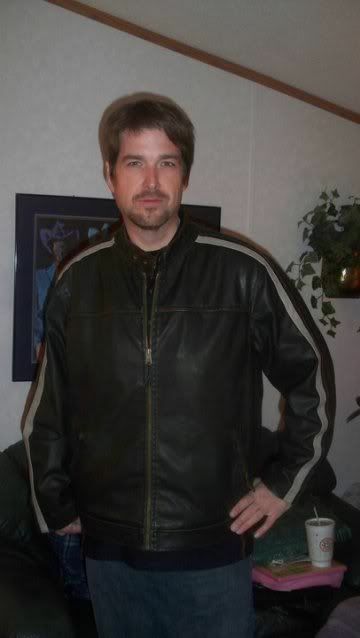 And I found a great jacket at a wonderful price. To just stroll into a store and grab a jacket off the rack and have it fit---and to realize it wasn't the biggest they had in stock---in fact, it wasn't even in the "big and tall" section---that is a wonderful NSV. These are incredible days! 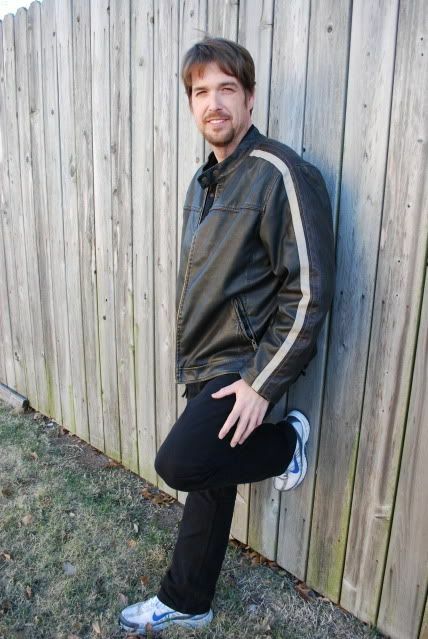 I just received word that I'll be featured again, real soon--on AOL's thatsfit.com, as a "best of" success story of 2010. I'm thrilled! The doors that have opened because of that initial AOL feature, has been amazing. I swear--someday, I need to give a special gift back to Martha Edwards, the writer, and AOL. I sincerely appreciate their incredible support! My focus for December must be squarely on finishing the manuscript for my first book. By Christmas, without fail. It's my Christmas gift to me! 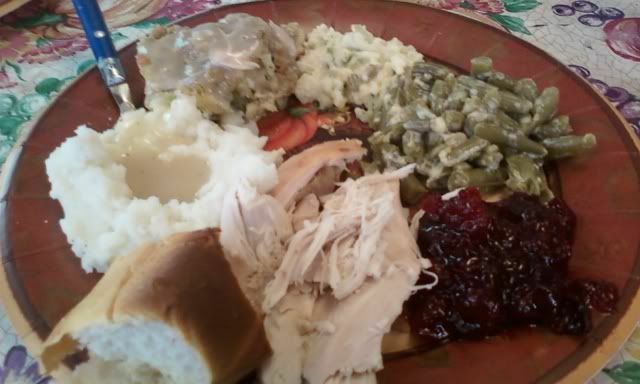 My Thanksgiving plate. It was simple, plenty, delicious, filling, and wonderful! I was so excited to try the dessert Karen made--I had consumed a few bites before I remembered to snap a picture!! 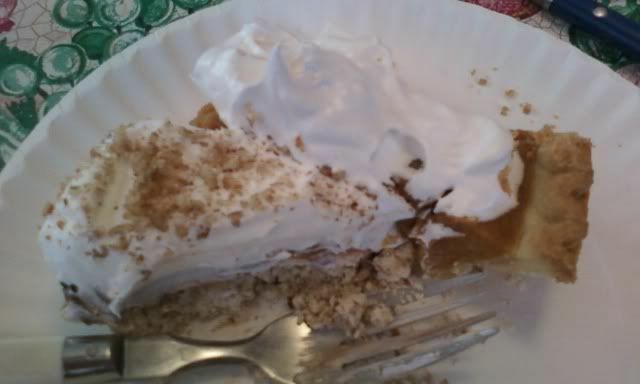 That small slice of pumpkin pie there, that was all the pie I consumed on Thanksgiving...Very nice! 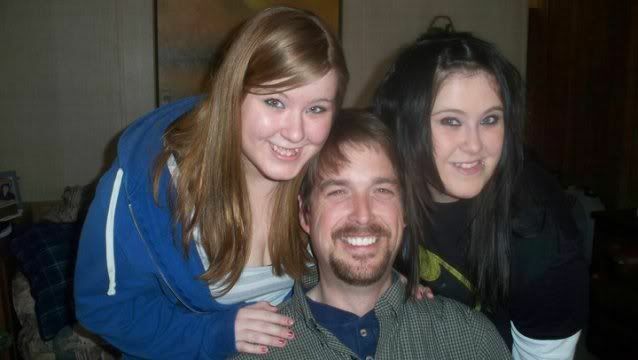 My daughters--I love them sooooo much! 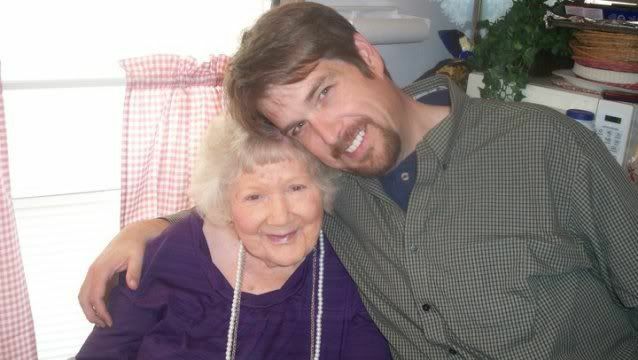 With grandma on Thanksgiving--She's the sweetest, most precious grandmother in the world! Mom and me--Enjoying Thanksgiving in her kitchen! 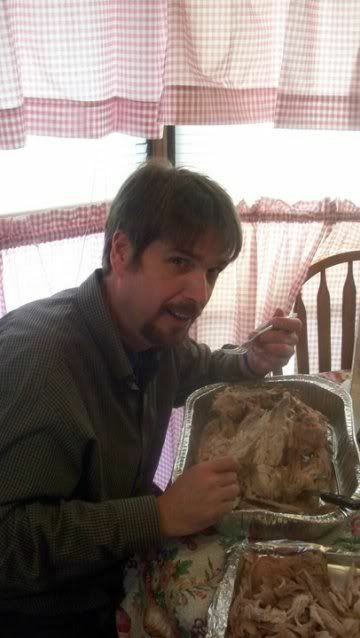 Eating the turkey...I mean, uh---carving the turkey--yeah, that's what I was doing! !